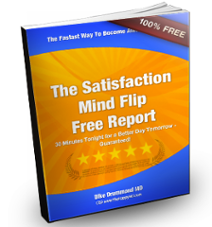 Bypass a Happiness Blind Spot Unique to Doctors with the "Satisfaction Mind Flip" Free Report. Use this research proven tool to reveal a source of satisfaction and fulfillment lying - literally - right in front of you! 20 Minutes with this report tonight, guarantees you will have a better tomorrow. Your neuroanatomy and medical training naturally keep you focused on problems and risks, when a more satisfying life and practice are literally right under your nose. Lower Your Stress and Burnout Levels Tomorrow by taking just 30 minutes to complete the "Satisfaction Mind Flip" Tonight. You won't believe the "Flip" until you see it. This is a simple tool that comes from the field of "Appreciative Inquiry". The Mind Flip is the quickest way to use these research proven happiness tools in your life. The same Mind Flip will quickly make you a Better Parent at home and a More Effective Leader with your team at work. Enter your email in the box above and click the button for Instant Access to your FREE Report. If you have any questions or would like tips and support to dive into the Mind Flip right away, please use this contact form to send us a quick message. Here’s to you realizing something extraordinary when you do the Mind Flip!